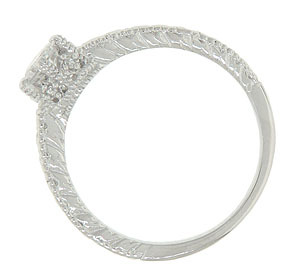 A repeating leaf and stem pattern adorn the band and sides of this 14K white gold engagement ring mounting. The top and sides of this retro modern mounting are covered with detailed repousse. The mounting measures 5.96 mm in width. 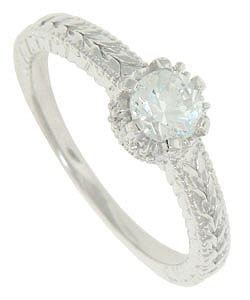 The ring is photographed with its matching wedding band WBS3D30467W (sold separately). Size 6 1/2. We can re-size or special order in any size. Also available in 18K, yellow gold and platinum.